Following an outstanding 2011, premier independent hip-hop artist Tech N9ne is starting off the New Year with an ambitious start. The Strange Music recording artist is gearing up to embark on his Hostile Takeover 2012 tour with Bad Boy/Interscope Records rapper, and MTV’s 2011 “Hottest Breakthrough MC”, Machine Gun Kelly. The tour will kick off on March 24th in Tech N9ne’s hometown of Kansas City and continue through July. A trailer announcing the tour and featuring some of Strange Music’s brightest acts such as Krizz Kaliko, Mayday, Prozak and Stevie Stone, who will be joining Tech N9ne on the Hostile Takeover Tour, was released in mid-January and can be viewed here. With over 90 performances scheduled in just 99 days, the Hostile Takeover 2012 tour will be the longest consecutive tour in rap history and the only time this year fans will be able to see the enigmatic Tech N9ne perform his one-of-a-kind stage show. Over the last decade, the Kansas City recording artist has continued to build his Stange Music brand by developing a fervent following of devoted fans, captivated by his uncanny energy and relentless touring schedule. By the mid-2000s, Tech N9ne was performing over 200 shows a year in high-octane sets that have earned high-profile endorsements from the likes of Lil Wayne, Busta Rhymes and many others. In 2011, the rapper released his critically-acclaimed twelfth studio album, All 6’s And 7’s, which debuted at No. 1 on Billboard’s Independent and Hip-Hop/R&B charts, and No. 4 overall on the Top 200. Tech N9ne also delivered a show-stopping, stand-out feature on Lil’ Wayne’s Tha Carter IV, which sold nearly 1 million units in its first week of release last summer. Hostile Takeover 2012 tour dates are below. For a complete listing, set-times and tickets, please visit strangevip.com. 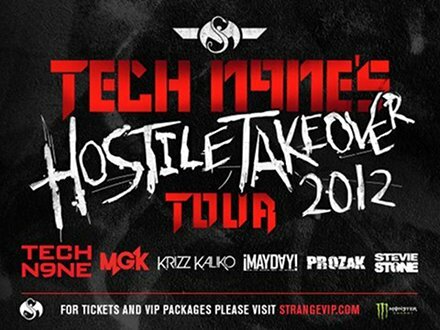 What do you think of the lineup for Hostile Takeover 2012, including Machine Gun Kelly? What do you hope to see on this tour?